When it`s Autumn the world is awash with colour. A leaf collage is one way to capture it and make some interesting pictures and other projects. But you don`t have to stick to using real leaves. You can make some from different materials to create texture and shade. My list is just to get your creativity juices going and an aid to teaching kids art. You can use them, alter them, or let them spark some other ideas. So let`s look and see what I have collected together. If you have pastels you will need fixative. You can use your mums hair lacquer but ask first. I have used velvet material but you can use any fabric you like, even patterned. The paper leaves are copies of the real ones. 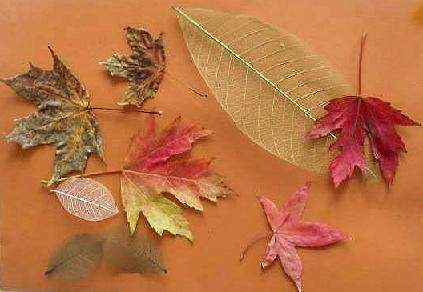 Collect your leaves when you see them start to drop from the trees. When you get home, place some leaves in a folded sheet of paper and between the pages of a heavy book. This will flatten them and stop them from curling up as they dry. 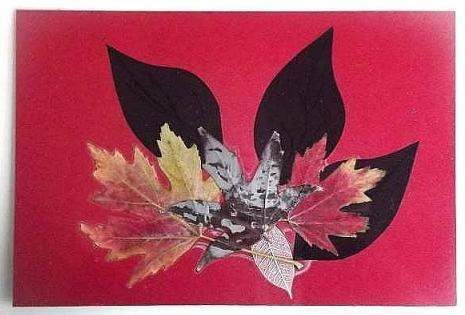 You can buy different colours of skeleton leaves which give your collage a soft look. Another technique is to use them as a stencil. Brush paint on them and print the vein patterns onto the paper. Using pastels or colouring pencils, draw copies of the foliage you collected. Here is how I did the sketched leaves for a leaf collage. Choose a contrasting background to display your art. Play around with the different colors and textures of the leaves. You can use just one type of material or several combinations. 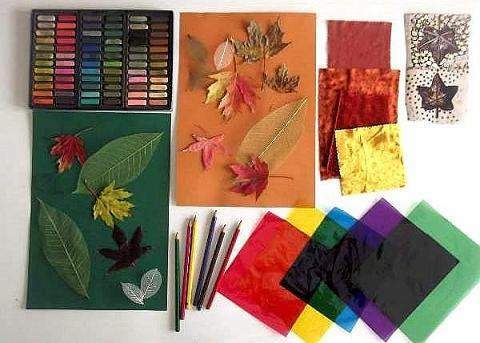 If you choose to use cellophane, overlap the leaves to form interesting new colours or place them in the background when using other types of materials to give a shadow effect. 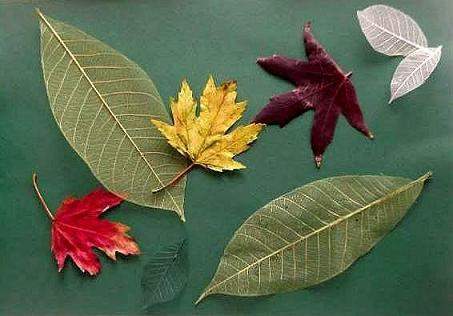 How you place your leaves can lead the viewers eyes from one direction to the other. Notice in the green collage that most of the leaves point downwards so the eye will move from top to bottom. The top row to the left and the bottom row to the right. The eye tends to follow the flow. In the orange display the eye tends to move in a circular motion as nearly all the leaves seem to be flowing in a circular direction almost like the wind is swirling them. 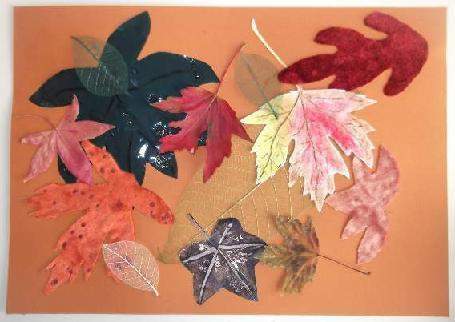 Play around with motion in your Autumn craft collages too. I had some leaves left over so I laminated them for an interesting place mat. 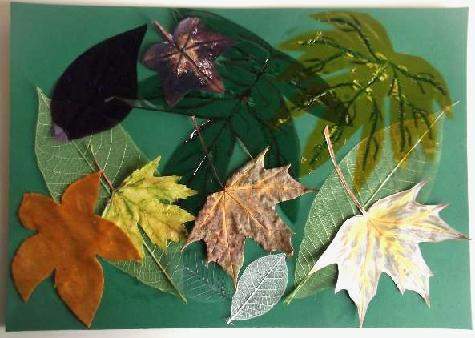 Have fun making a leaf collage of your own and do post a picture of it here to enter our visitor`s art gallery. At this time of year there is a change of light and mood so there are other opportunities to be creative and play with colour as the nights draw in. Paper lantern crafts are a fun way to use light with colour.